I love stocks that are making 52-week highs. I love them even more when they’ve got ALL-TIME highs (set in 2011) in their sights. We’re approximately 22% away from there at the moment of this writing, but as ZGNX is now breaking out of a five month base where it digested a 150% gap higher in late September, it seems to me one good sneeze gets us there quicker than you think. These are the types of opportunities I like to play and one that will likely benefit from having a wide trailing stop loss. As we ride this position, we’ll trail it with a 20% stop from highs. Hopefully this will give us plenty of leg room to put ourselves in a position to harvest some meaningful gains. This is probably a good time to remind you to pay special attention to your position sizing. While a 20% stop loss may feel too large for some, it all comes down to how you size your trade in relation to your portfolio. 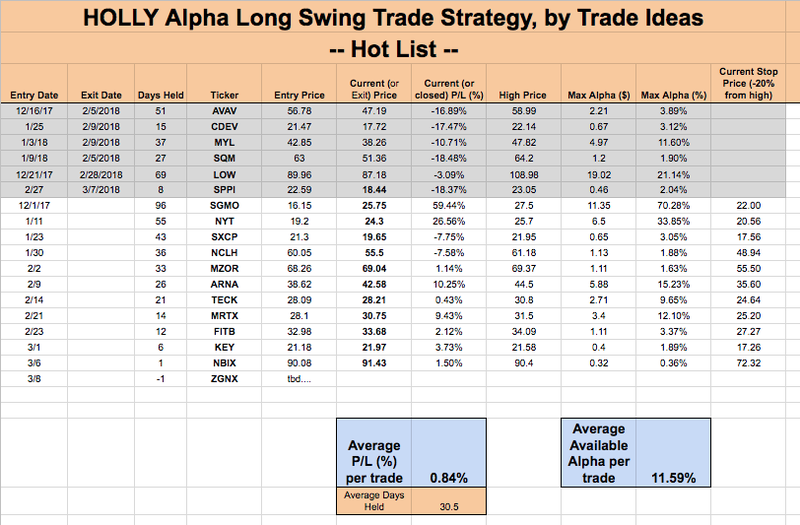 Everyone has their own comfort level when it comes to risk, but I’d advise everyone to size this position (and all positions in the HOLLY Hot List model portfolio) such that if you take a maximum 20% positional loss, it will only equal no more than 1% of your equity. We were stopped out of $SPPI today. Bummer as that was a quick hit. We only held that position for 8 days and really didn’t see any opportunities to pocket any profits. I hate that. Oh well. We dust ourselves off and find comfort in knowing that several of our positions are continuing to work well, including NYT and SGMO.